For my HP OfficeJet Pro 8600 Plus does it take all XL cartriges? Hello I need ink cartridges for myHP Officejet Pro 8600 plus e all in one printer N911g. I have a black cartridge CN-045AN HO95OXL BK will this be ok to use along with the colour cartridges Thks. Hi Cavin, thank you for your question. If your printer is the HP Officejet Pro 8600, then the compatible cartridges you have mentioned will indeed work for this model. Are your CN045AE, CN046AE, CN047AE and CN048AE inks HP original cartridges as produced by HP or are they remanufactured / refilled cartridges? I'm having trouble with recycled cartridges from another supplier. Many thanks. We supply both genuine and recycled HP 950XL / 951XL ink cartridges. The genuine HP Officejet Pro 8600 cartridges are easily identified by the product image which should show the official HP packaging and the HP logo under the image. Any item referred to on our website as "Genuine" is a brand new cartridge manufactured by HP. The recycled HP Officejet Pro 8600 cartridges are referred to as "Premium brand" and come in Cartridge Save boxes. They are very reliable and work to the same high standard as the genuine HP 8600 inks. We also offer you a 100% money back guarantee on all of these HP Officejet Pro 8600 e-All-in-One ink cartridges. Can a HP Officejet Pro 8600 printer use a 940XL ink cartridge even though I know the correct ink for this printer is HP 950 and HP 951? The HP 940XL cartridge isn't compatible with this printer so you need to use the HP 950 / 950XL and HP 951 / 951XL cartridges listed on this page in your HP Officejet Pro 8600 e-All-in-One printer. I need ink for my Officejet Pro 8600. Is the multipack what I need as it's not printing in colour? The HP Officejet Pro 8600 e-All-in-One is a 4 colour inkjet printer that requires you to have all four of the black, cyan, magenta and yellow ink cartridges installed with some ink in each cartridge to print in any colour. Your printer should notify you when a colour runs out and you should be able to replace each colour individually as and when they run out. If you need to replace more than one of your Officejet Pro 8600 e-All-in-One cartridges then we would advise you to purchase a multipack for better value. How do you replace the cartridges in the Officejet Pro 8600 e-All-in-One printer? Do you supply CISS for a HP Officejet Pro 8600e printer? No, we don't stock the correct type of ink used in a CISS (Continuous Ink Supply Sytem). This "aftermarket" ink is made by non-OEM manufacturers and it would require that your HP Officejet Pro 8600 e-All-in-One printer is modified in order to use a CISS. We don't offer this service and we can only supply you with the standard consumables such as genuine or compatible ink cartridges for the HP Officejet Pro 8600e printer. Unlike its sibling, the HP Officejet Pro 8600 e-All-in-One offers multifunction capabilities by combining a scanner, fax, and copier with the high-performance colour inkjet printer, making it an efficient and comprehensive device for a home office and small business. The HP 8600 all-in-one printer is surprisingly affordable, too, with a reasonable initial price and cheaper running costs. Its wireless data transfer capability is a bonus for those who need to print from mobile devices. HP integrated a 33.6Kbps fax modem, a digital copier, and a flatbed scanner with the inkjet colour printer of the Officejet Pro 8600 e-All-in-One. This device features a 2.65-inch touch-screen interface and a 12Kg frame that measures 19.4 inches wide, 11.8 inches tall, and 16.3 inches deep. The HP Officejet Pro 8600 e-All-in-One printer uses a 4-ink system and connectivity options include high-speed USB and Ethernet. It is reasonably fast, comes with an auto duplexer and automatic document feeder, and excellent for high-volume output with its 250-sheet paper tray. 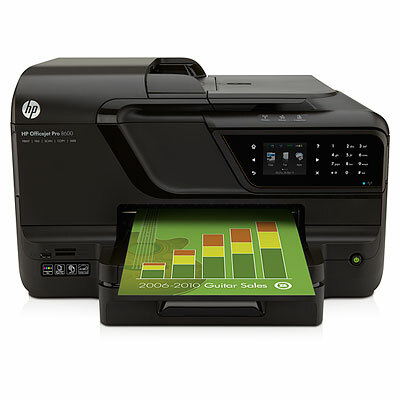 The HP Officejet Pro 8600 e-All-in-One supports cloud printing and offers flexible network-friendly and connectivity options. Text output looks good and the legal-sized flatbed scanner is efficient enough for standard-sized office documents. The fax feature of the Officejet Pro 8600 e-All-in-One inkjet printer is speedy, comprehensive, and compatible with PC faxing. The HP Officejet Pro 8600 cartridges contain a high capacity of ink with yields that are more comparable to laser cartridges rather than normal sized inks. The HP Officejet Pro 8600 e-All-in-One needs a better auto document feeder that can duplex two-sided documents for the scanner. The small touch-screen interface isn't intuitive and responsive enough. Another problem is the weight and bulk of the HP Officejet Pro 8600 e-All-in-One, making it quite difficult to lift and transport. The HP 8600e colour inkjet printer needs a better engine that can print accurate photos and graphics.